Image 1 (uci.edu): There are billions of clocks in our world, but the most important one of all, our biological clock has gained scientific attention only over the past couple of years - a momentous mistake, as scientists are starting to realize. Before we get lost in all the complicated details, yet again, let's start out right away by shedding some light (pun intended) at the most obvious, easiest to understand and to a great degree tweakable control parameter of our circadian rhythm: Light! Sunlight! What do you know about it? 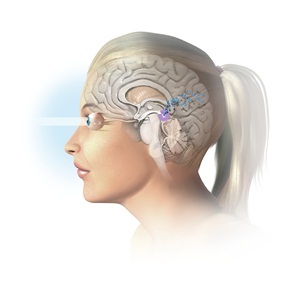 And how does it control your circadian rhythm? Figure 1: Each light source has its characteristic spectrum, i.e. 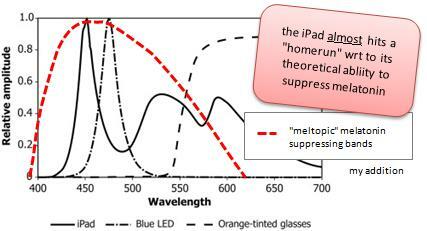 it emits light with different frequencies (in case you forgot, you get the frequency of light by dividing the speed of light by the wavelength), or physically speaking photons with a characteristic energy distribution - relative to the total amount of photons sunlight, for example, contains much more highly energetic "blueish" photons, while the light of one of the classic Edison-esque light bulps contains a higher amount of low energy (high wavelength = low frequency) "reddish" photons. Now the actual "spectrum", as scientists call the set of distinct frequencies in a certain signal, of our sunlight, is - contrary to what figure 1 may suggest - not continuous, but discrete. Moreover, for any given light source (our sun included) the occurrence or non-occurence of certain frequencies is highly dependent on the particles by which the light is emitted. Astronomers use this fact to their advantage and determine the material composition of stars by analyzing their characteristic light spectrum, which, in the case of our sun, covers a visible and non-visible part (in this case "visible" designates visible to our eyes). The reason I am emphasizing this here, is simple: Just as or sun has its characteristic spectrum, the light bulb in the lamb on your desk, the backlight of your computer screen, the tube of your old television screen, the lamps on the street, and so on and so forth... they all have their individual spectral foot- or maybe I should rather say frequency-print. What does blue light say? It says: "Get up, it's a new day!" This is important, because sunlight and a couple of million year later the light of fire, evolution has had little time to catch up with all those "strange" light sources it is facing today. And despite the fact that the ingenious invention, we know as "eyes", has undergone numerous evolutionary revisions, ever since nature invented the prototype (probably) during the so-called Cambrian Explosion a couple of million years ago, the specific composition of the light it was made to detect never changed, until homo (sometimes not exactly) sapiens entered the scene and had the ingenious idea to use artificial light source to finally put an end to the annoying rhythmicity of light and dark and boring spectral homogeneity of the light, we are now no longer exposed to on daily basis only, but - more often than it would be conducive for our health - on a nightly basis, as well. Only over the course of the past two to three decades, however, are we finally beginning to understand that the handy 24/7 availability of "light" at any desired intensity, along with the oftentimes unnoticeable otherness of this light with respect to its spectral composition (see figure 1) may constitute one of the most underrated health risks we are facing in our 24/7 convenience society: Light pollution. What does artificial light say: "Stay up it's not yet night... but wait, it's not really day, either!?" The sentence "most polluting are the lamps with a strong blue emission, like Metal Halide and white LEDs" from one of the most recent reviews of the literature on "light pollution" does already tell you something about where we are heading, here. With the impeding disappearance Thomas Edison's good old light bulbs, the 'fire from the ancestral cave', as I would like to phrase it for all paleo lovers out there, is about to be extinguished ... isn't it interesting, by the way, that the discontinuation of the production of classic light bulbs is vindicated by environmental concerns ... but before I am losing sight of the topic at hand, let's rather take a look on how much worse those "modern" lighting systems actually are and what alternatives we have, if we don't want to return into our fire-lit or pitch dark (man-)caves certain people nobody would even know if it were not for the 100% non-paleolithic 24/7 "enlightening" invention of the Internet as yet another one cave... ah, pardon "one size", of course, fits it all solutions the lights from our computer screens are transmitting right into our brains. If we take a closer look at the data in figure 2 we will certainly have to concede that the fire in the cave which does by the way have the greatest resemblance to the good old 65W incandescent light bulb from figure 2 was still relatively benign as far as its ability to suppress our natural melatonin production is concerned - 26% and even 54% less suppressive than energy efficient metal halide and LED based light sources as they are used in the funky xenon lights of your shiny new Porsche, or the bright display of your iPad, to be precise. And still, according to Falchi et al. who published a paper with suggestions on how to reduce the overwhelming (nocturnal) exposition to bright and more-importantly "bluish" (in this context this refers to light sources which emit signifcant amounts of light from the higher frequencies / lower wavelengths of the visible spectrum, cf. figure 1, blue) light sources, there would be a better solution to illuminate our streets at night than large campfires or energy-inefficient incandescent light bubs: The yellowish low pressure sodium lamps, at least those of you who live in Germany may remember from their childhood, when they were still used to illuminate crosswalks along otherwise unlit roads, constitute the least "light polluting" an,d at least from physiological point of view, most "sustainable" nocturnal lighting solution (Falchi. 2011). A call for action: Reduction, revision, regulation? Figure 3: Superposition of the spectra of sunlight.classic light bulbs and the meltopic = melatonin suppressive frequency band (latter from Hallan. 2004). 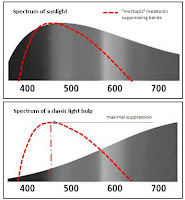 It is obvious that the relative contribution of melatonin suppressing high frequency (=low wavelength ~380-550nm) light is significantly lower for light bulbs than for sunlight. With an almost monochromatic light emission in at 589.0 and 589.6 nm low pressure sodium lamps (not shown in this figure) are yet unrivaled, among the low(er) meltopic light. I will leave it up to you in how far you feel these measures are (a) effective and (b) how realistic it is to assume that they will put into practice anytime in the near future. In case you agree with my personal assessment, though, and believe that relying on governmental regulation usually produces more problems than it solves, you will be happy to hear that the use of the previously mentioned blindfolds, dark curtains and even the use of blue blocking glasses, as suggested by Dom Leste in response to my recent post on the "1lbs Fat Loss Bonus of 40 Minutes of Additional Sleep", can provide the much needed relief from the melatonin suppressing effect of constant "blue-light" exposure (Sasseville. 2006). 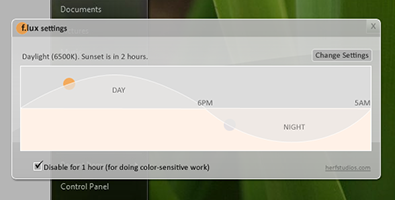 Image 3: F.Lux is probably the most popular program to adapt your screen brightness and hue to the time of the day, but there are alternatives and mobile solutions of which Lux, for example, looks pretty neat. And just in case you did not get your daily dose of SuppVersity news before it's actually high time to shut off your computer and mobile devices, there are meanwhile a couple of programs that will adjust the screen brightness and hue according to the time of the day. Based on my cursory review of the available software solutions (note: the angle at which the sunlight enters the atmosphere is the reason that it changes its "color" in the course of the day), the F.Lux software by Stereopsis is apparently the most popular among a whole host of programs which are available for almost every operation system from A as in Android to Z as in ... well, Z as is "WindowZ" *rofl* (see caption of image 3 for links). So do those programs work? Or do they at least make sense? Don't worry, you don't have to reside in paleolithic darkness - thanks to neolithic science! For the rest of you, I have already outlined a couple of easily implementable strategies to avoid the negative aspects of artificial light exposure, where the light (artificial or not) is not a necessary or desirable part of your life (blindfolds, curtains, special light sources, computer software, orange blue-blocking glasses, keeping the lights low, dimmers, etc. ; check out my previous blogpost "1lbs Fat Loss Bonus of 40 Minutes of Additional Sleep", as well). Apropos desirable, not all neolithic technology is bad and I am honestly darn happy I am no paleolithic hunter, let alone gatherer! Used appropriately, even the funky over-sized LED screen I recently got at the office has its advantages. Compared to a regular LCD screen, for example, it will significantly improve my working memory/attention, when I am working overtime (cf. Cajochen. 2011). Since I don't intend to make use of this advantage today, however, you will have to wait another week for the next installment of this series to be written if you want to learn about behavioral, psychological and technological tweaks and gimmicks by the means of which you can use light(s) to your advantage to realign a compromised circadian rhythm, increase cognitive and physical performance, minimize the negative effects of after hours or shift work and much more. I for my part am now enjoying the sunlight for maximal melatonin suppression, cognitive and physical performance and a powerful signal to my circadian clock that she is still accurate and would suggest you do the same - unless you want to leave me some feedback on this first installment of the Circadian Rhythmicity Series and where you want it to be heading, of course! American Medical Association (AMA), House of Delegates. Resolution 516 e Advocating and Support for Light Pollution Control Efforts and Glare Reduction for Both Public Safety and Energy Savings. 2009. Bues M, Pross A, Stefani O, Frey S, Anders D, Späti J, Wirz-Justice A, Mager R, Cajochen C. LED-backlit computer screens influence our biological clock and keep us more awake. Journal of the Society for Information Display. 2012; 20: 266–272. Bukalev AV, Vinogradova IA, Zabezhinskiĭ MA, Semenchenko AV, Anisimov VN. Light pollution increases morbidity and mortality rate from different causes in male rats. Adv Gerontol. 2012; 25(1):49-56. Cajochen C, Frey S, Anders D, Späti J, Bues M, Pross A, Mager R, Wirz-Justice A, Stefani O. Evening exposure to a light-emitting diodes (LED)-backlit computer screen affects circadian physiology and cognitive performance. J Appl Physiol. 2011 May;110(5):1432-8. Epub 2011 Mar 17. Falchi F, Cinzano P, Elvidge CD, Keith DM, Haim A. Limiting the impact of light pollution on human health, environment and stellar visibility. J Environ Manage. 2011 Oct;92(10):2714-22. Froy O. Metabolism and circadian rhythms--implications for obesity. 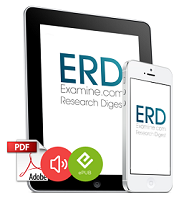 Endocr Rev. 2010 Feb;31(1):1-24. Gooley JJ, Chamberlain K, Smith KA, Khalsa SB, Rajaratnam SM, Van Reen E, Zeitzer JM, Czeisler CA, Lockley SW. Exposure to room light before bedtime suppresses melatonin onset and shortens melatonin duration in humans. J Clin Endocrinol Metab. 2011 Mar;96(3):E463-72. Hollan J. Metabolism-inﬂuencing light: measurement by digital cameras, Poster at Cancer and Rhythm Oct 14-16, 2004, Graz, Austria. Soc for End. "Melatonin" in Glosarry. 2011 March < http://www.yourhormones.info/hormones/melatonin.aspx > visited 2012 Aug 05. UCI.edu. 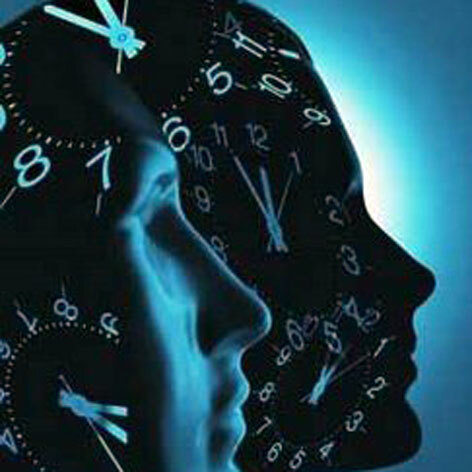 Illustration to article "The Clock Watcher". < http://www.uci.edu/features/2009/05/feature_circadian_090528.html > visited 2012 Aug 05.